Niagara Conservation is well known for producing high quality products and when it comes to handheld showerhead, they have taken the market with a storm. Their 2 .0 Gpm Niagara Handheld Massage Shower head is without a doubt one the best bathroom fixtures you can install. It is a good choice for new installation as well as for bathroom remodeling. This handheld shower is designed for the great performance. Its delivery of 2.0 gallons per minute of water saves up to 20 percent in water usage if you compare it with other hand held showers currently in the market. Its non-aerating spray technology ensures less temperature loss with optimal energy savings. It also features 9-jet turbo massage with settings from forceful to gentle. You do not have to be skilled plumber to install this showerhead. Each unit comes with clear instructions on how to start and finish the installation process. Installation is by hand meaning you do not need any specialized tools for that purpose. The tools you need include; 2.0 gpm Niagara Chrome Hand Held Shower head, Teflon tape, adjustable wrench or pliers, rubber sealing washer, terry cloth, safety goggles and possibly a ladder. The design of earth 2.0 Gpm Chrome handheld shower head is optimized for luxury and style. It combines traditional design with slight touch of modernity giving your bathroom a great facelift. Note that the showerhead combines luxury with performance. The showerhead comes with a 72-inch, tangle free hose with non-removable flow compensation. Its ability to self-clean with chrome finish makes it look new at all times. Some users have noticed this showerhead has high chances of leaking especially where the ball bearing flexible part is up top constantly. 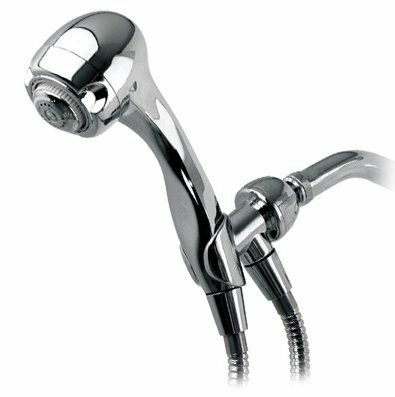 In case you are looking for the best handheld showerhead to purchase then you can try out the 2.0Gpm Chrome Handheld Shower head from Niagara Conservation. It combines great performance with luxury to deliver the best value for your money. It is also extremely easy to install and very easy to maintain. Check it out and I am sure you will love it. Previous How to fix a Leaky – shower slow drip?